It has been a beautiful week here at the cottage and we have sure enjoyed being out doors in the garden. You might enjoy seeing what we have been doing in our latest garden post on the side bar. Last week I taught a class for some young women who will soon be getting married and wanted to learn some more about meal planning becoming a part of their time management, they were all so excited to see how much time and money could be saved by setting aside a certain time every week to plan the meals. Thanks so much for stopping by to spend some time at the cottage with us today your visits are always very special to us. Hope you have a fantastic week and come back to see us real soon! 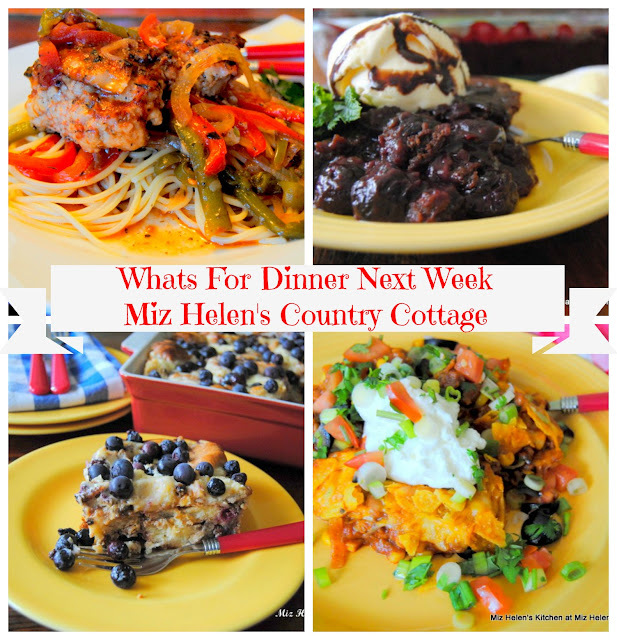 Looks like another delicious week Miz Helen! I'm a casserole lover so the ham and pasta casserole looks really good to me! This meal plan is just too much. I think I gained a pound just reading it. Yum! I could really go for some of the cherry cake and I love all the salads. Those young ladies are very lucky to have you teaching them about meal planning, Miz Helen! Your menu looks wonderful as always. You've got some wonderful recipes here this week. Thank you so much for sharing with us at the Hearth and Soul Hop. Oh, double yum! These dishes make me so hungry. Thanks so much for sharing with us at Funtastic Friday.